If I wasn’t doing this I’d be a: journalist or chef. Most impressive person I’ve ever met: is my father. He inspired me to follow my heart and hang in there even when times get tough. I unwind by: cooking and visiting friends and family on the East Coast. On my desk right now is: lots of paperwork and my favorite Ringling Bros. mousepad, courtesy of some Feld friends. My favorite IAVM program I ever attended was: VMS at Oglebay 2011 – 2012. I made friends for life. If I were on the other side of the seats, I’d be a: tour security manager. One trait an up-and-coming venue manager should have is: flexibility. One up-and-coming venue star in the arena industry is: my friend Lauren Simpson. She is a huge inspiration and has taken on so many responsibilities at her venue (Grand Ole Opry) and multiple leadership roles with IAVM. She’s a rock star! One of my goals for this year is to: continue to grow and develop my staff through new and innovative training programs and processes. How do you plan to help elevate the profession? So many people gave back to me when I was a student and trying to get into the industry—I’d love to give back to others who are there now. Where do you see new growth opportunities in the profession? In understanding new and changing technology as it relates to our business. Everything from ticketing to social to wayfaring and security systems. How do you stay current with industry trends and developments? I read a lot of the trade publications and stay in touch with industry friends at different buildings. I’ve also gotten into Twitter lately as a great source of up-to-the-minute information on a myriad of things relating to our industry. Who are three people you’d invite to a dinner party and why? Steve Spurrier, Drew Brees, and Taylor Swift. The first two because they are both great leaders with very different and compelling styles. Taylor because she’s been someone I’ve admired since working several of her shows. She has amazing energy and an upbeat attitude and cares about her fans as much as any artist I’ve encountered. She seems like a wonderful role model. 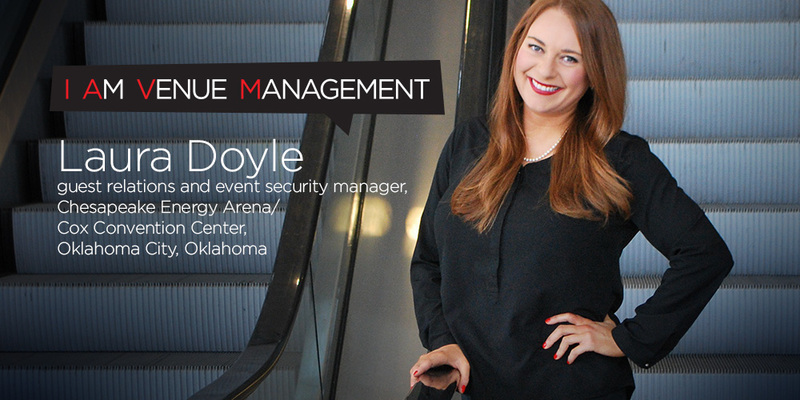 Laura Doyle is guest relations and event security manager at Chesapeake Energy Arena/Cox Convention Center in Oklahoma City, Oklahoma.